allylic alcohols epoxidation and hydrogenation of ketone derivatives have been fruitfully applied for production of L-menthol , glycidol  and chiral aminoalcohols as pharmaceutical building blocks , respectively. The intensive research aimed at even more enantioselective processes has led to a growing structural diversity of catalysts besides the traditional transition-metal complexes and to an astonishing variety of asymmetric reactions, whose systematic classification and discussion [117-120] goes beyond the scope of this text, stimulating at the same time the development of new appealing concepts and strategies for modern organic synthesis. 118. Ojima I (ed) (2000) Catalytic asymmetric synthesis. Wiley-VCH Inc.
119. 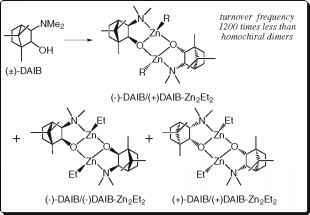 Mikami K, Lautens M (eds) (2007) New frontiers in asymmetric catalysis. 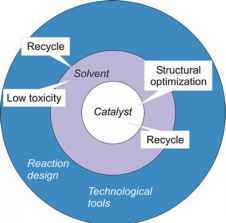 John Wiley & Sons, Inc.
Abstract The structural optimization of catalysts is a key topic in the development of more sustainable asymmetric catalysis. An astonishing variety of chiral ligands for transition-metal complexation is today available and the identification of novel active compounds has been aided by computational and mechanistic studies as well as combinatorial methodologies. Besides the most investigated C2-symmetrical ligands, the potentiality of unsymmetrically disubstituted or monodentate ligands has been explored in conjunction with less toxic and/or less expensive metals whereas chiral amplification and enantiomer-selective effects resulted in the option to use non-enantiopure ligands saving satisfactory enanti-oselectivity. In the last years different classes of simple organic molecules have been shown highly effective in promoting a range of catalytic enantioselective transformations of carbonyl and iminic substrates through a number of general activation modes and organocatalysis has been recognised as a powerful methodology complementary to metal-based asymmetric synthesis. More recently, the concept of dual activation has led to the development of bifunctional catalysts with excellent performances. active compounds asymmetric catalytic synthesis represents by itself a more powerful methodology with respect to the other stoichiometric counterparts (according to ninth principle of ''green chemistry'') but opportunities for substantial improvements in combining the high performances, of catalytic reactions with the increasing need of sustainability demanded by the modern industrial chemistry are enormous. Taking into the account all the factors influencing the overall efficiency of a catalytic process different strategies, used alone or in a synergistic combination, have been successfully developed (Fig. 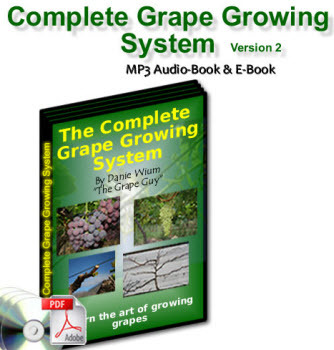 2.1) and they will be discussed in this and the following chapters with main focusing on the concepts rather on a systematic classification of their applications by reaction type. Since the effectiveness of an enantioselective catalytic reaction mainly resides in the nature of the catalyst, whose chemical, stereochemical, electronic and steric features all contribute to the control of asymmetric induction, the development of a green asymmetric process cannot be detached from the intensive search of new catalysts and innovative methodologies deriving from a better understanding of the reaction mechanisms. Both these approaches have been fruitfully explored leading to an expansion in the portfolio of enantioselective catalysts and asymmetric reactions today available. In this section different classes of catalysts and the related applications are surveyed together with some cost-effective strategies aimed to achieve good enantioselectivity even employing non enantiopure or racemic ligands. Most asymmetric catalysts developed so far are metal-complexes with chiral organic ligands that are able to influence the reactivity and selectivity of the metal center, so inducing the preferential formation of one of the possible enantiomeric products. Many thousands of chiral ligands have been reported up to now and their number surely will grow since no constraints virtually exist in terms of molecular design. Single or combined modifications in the stereogenic elements and molecular symmetry of carbon skeletons, in the nature of coordinating atoms and metals as well as in the electronic and steric properties of substituents can give rise to a huge structural diversity of ligands, the only limit being imposed by their synthetic accessibility. Despite of the large number of effective ligands available, a relatively small number of compounds, called ''privileged ligands'' , have displayed broad applicability in mechanistically unrelated asymmetric reactions with high levels of enantiocontrol. These ligands (Scheme 2.1) share the common structural feature of C2-sym-metry, advantageously considered as a way to reduce the number of possible iso-meric metal complexes, substrate-catalyst arrangements and reaction pathways with a beneficial effect on enantioselectivity and in mechanistic studies . In symmetric bidentate diphosphines, as BINAP 1 [3, 4] and related atropisomeric derivatives [5, 6], the formation of a sterically constrained seven-membered metallacycle (Fig. 2.2a) with a skewed conformation in which the P-substituents are strongly oriented forward past (pseudo-equatorial) or away from (pseudo-axial) the metal is thought to be responsible for the efficient transmission of the backbone axial chirality. Although the best known applications of BINAP and its analogues concerned the enantioselective hydrogenation of olefins and ketones, complexes of these ligands with different metals have been reported as effective catalysts in many C-C bond forming reactions [5, 7]. Fine optimization of enantioselectivity has been obtained by tuning the size and the electronic properties of substituents introduced on suitable positions of the binaphtyl- or biaryl backbones, with direct consequences on the biaryl dihedral angles and basicity at phosphorous atoms [8-11]. The influence of bite angle  in metal-diphosphines complexes has been evidenced in Pd-allylic alkylation and, within a serie of diphoshines, the creation of a larger chiral pocket around the metal provided a more effective embracing of the allyl group, that became prone to be attacked by the nucleophile at one end preferentially [13, 14]. In the group of privileged ligands, C2-symmetric O,O-bidentate BINOL 2  and TADDOL 3 derivatives  bind well to many main-group and early transition metals and their Ti(IV)-complexes have found extensive application in Lewis acid mediated reactions as carbonyl-ene additions, nucleophilic additions of organometallic reagents to aldehydes, Diels-Alder reactions and other cycloadditions . Noteworthy, good levels of asymmetric induction have been achieved with TADDOL ligands despite of the distance of dioxolane stereocentres from the metal, in consequence of the fact that upon complexation a trans-fused bicyclic system is formed in which the rigid geometry and the stereochemistry of the ketal ring strongly influence the positioning of aryl groups in the metallacycle in a pseudoequatorial/pseudoaxial arrangement, with the pseudoaxial substituents believed to act as stereocontrolling elements (Fig. 2.2b). synthesis from simple amino alcohols as chiral precursors. The flexibility in the standard synthetic protocols and the ability in complexing several metals have allowed the introduction of different substituents on both the oxazoline rings or methylene bridge and the tailoring of BOX-catalysts in many C-C bond forming reactions . Besides the first application of a BOX-ligand in Cu(I)-promoted cyclopropanation of olefins with diazoacetates, more recent examples include Friedel-Crafts acylations of indoles [20-22] and addition of aldehydes to a-lithiated sulfones  that proceed with excellent diastereo- and enantio- selectivity. The coordination of the two oxazoline nitrogen atoms with a metal gives rise to a nearly planar structure with limited conformational flexibility and the stereogenic substituents in the close proximity of the metal shield it from two opposite directions. In addition to the two points coordination with BOX ligand, two to four metal sites are available for coordination with substrate, solvent molecules or metal counter-anion and different geometries for tetra-, penta- or hexacoordinates complexes have been demonstrated by X-ray analyses . Interestingly, going from the tetrahedral to square-planar (or octahedral in plane) geometry a reversal in the selectivity could be expected since the corresponding movement of the coordinated substrate changes its accessible face and in this way both enantiomers of a given product could be prepared from a single ligand by promoting the switch between these two geometries with the choice of suitable metals or additives. 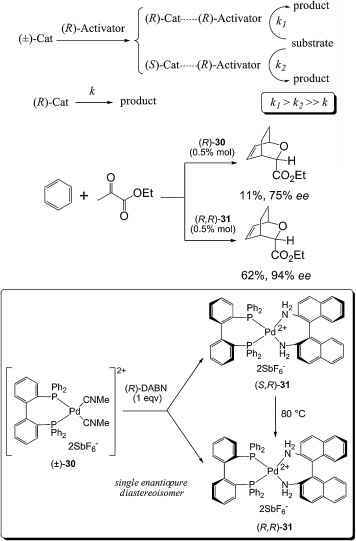 The feasibility of this approach has been nicely demonstrated in Diels-Alder reaction of cyclopentadiene with 3-acryloyl-1,3-oxazolidin-2-one and in the presence of Mg(II)-6 • ClO4 catalyst a complete reversal of stereoselectivity was observed upon addition of 2 eqv. of water, in agreement with the expansion of the metal coordination number from 4 to 6 and the consequent switch from a tetrahedral to octahedral in plane geometry of the catalyst-substrate intermediate . In the same way, parallel reactions with Cu(II)-6 • OTf and Zn(II)-6 • SbF6 or Cu(II)-7 • OTf and Zn(II)-7 • SbF6 catalysts gave complementary enantioselectivities that were related with the stabilization of planar or tetrahedral complexes by varying the oxazoline substituent from phenyl-to tert-butyl- group  (Scheme 2.2). Since the first reports of Jacobsen  and Katsuki , tetradentate salen-type ligands, as 9, complexed with Mn(III)- or Cr(III) have became the catalysts of choice for asymmetric epoxidation of unfunctionalised cis-alkenes, conjugate dienes and polyenes, Z-enynes and cyclic dienes , so expanding the scope of this useful reaction previously limited to allylic alcohols. Mechanistic studies and fine catalyst tuning by varying the diimine backbone and substituents on the aryl rings led to the second-generation catalysts, in which additional axial chirality was introduced at 3,3'-positions , and the influence of other reaction parameters (oxidant, donor coligands) was also intensively investigated. These Schiff basetype ligands , able to coordinate different metals stabilizing them in various oxidation states, have found interesting applications in cyanohydrin synthesis (VO-complexes) , addition of organometallic reagents (Zn-complex) , Ti-promoted pinacol coupling  and sulfoxidation , hydrolytic kinetic resolution of epoxides (Co-complex)  and Passerini multi-component reaction (Al-complex)  (Scheme 2.3). opened the way to the development and catalytic application of different classes of monodentate phosphorous derivatives [43-46], previously ignored on the basis of the assumption that a bidentate coordination fashion was essential to ensure conformational rigidity of the catalyst as a key feature for effective chiral induction (Scheme 2.4). The great potential of monodentate ligands, whose synthesis is more straightforward and economical than that of their bidentate counterparts, is still far from being fully explored and progress in this field is highly expected. Scheme 2.3 Beyond alkene epoxidation: versatility of salen ligands conjunction with additional P-, N-, O- or S- coordinating atoms and different chiral elements, as stereogenic carbon(s), axis or plane, are today available and widely employed in asymmetric synthesis . interesting examples of bidentate non-symmetrical ligands, characterized by two phosphorous atoms with different p-acceptor properties, that have shown comparable and in some cases superior activity with respect to the milestone ligands in Rh-mediated hydrogenation and hydroformylation reactions . Although several transition-metal based catalysts are nowadays routinely used in the preparation of chiral fine chemicals, further improvements in a "green" direction are possible in order to overcome the drawbacks related with the generation of metal residues and organic solvent wastes, the use of special equipments to ensure dry and inert reaction conditions, the costs connected with some precious metals and the synthesis of enantiopure ligands. In this context, the availability of even more active and selective ligands can allow lower catalyst loading and simplification in the purification steps for the products with direct consequences on waste reduction. Other promising approaches concern the use of alternative metals or non enantiopure ligands whereas organocatalysis has emerged as a powerful strategy in metal-free asymmetric synthesis (Fig. 2.3). Since subtle variations in the ligand structure can sensibly affect the asymmetric induction by modifying the chiral environment around the metal, the identification of the suitable catalyst for a given transformation still poses one of the most challenging endeavour in the development of effective processes and it is often the result of knowledge based intuition or serendipity as well as of time-consuming trial and errors optimization of other concurrent factors (metal, solvent, additives etc.). In the traditional iterative approach, based on the synthesis of one catalyst at a time and evaluation of its performances, ligands accessible through modular synthesis are preferred since structural modifications can be easily tailored by joining small units together through high yielding reactions. As some examples, the diversity of ring substituents in bis-oxazolines and phosphinoox-azolines comes from readily available chiral aminoalcohols whereas libraries of Schiff-bases can be obtained by systematic variation of both the aminic and aldehydic moieties. Structural modifications on carbon backbone or phosphorous atom of phospholanes can be easily introduced through a two step synthesis in which chiral 1,4-diols are converted into the corresponding cyclic sulphates and then treated with primary phosphines (Scheme 2.6). A) Bu2SnC!2, xylene; B) MeSO3H, CH2C!2, MS; C) Ph3P/CCl4/Et3N; D) ZnCl2, C!CH2CH2C! In an alternative strategy, combinatorial methods have been applied to enan-tioselective catalysis as a powerful tool for the generation and simultaneous test of a considerably larger number of candidates, leading to enhanced chances to find the catalyst with higher performances and the best reaction conditions . It has been also underlined that large structure-selectivity databases from combinatorial approach can be particularly useful to optimize novel and unexplored reactions and to promote the related mechanistic studies. Some libraries of modular catalyst have been prepared by automated solidphase synthesis technology  and, despite of the enormous number of accessible compounds in a "split-and-pool" method, the parallel approach has been preferentially used since it does not require deconvolution and the composition of each vessel is easily defined by its position in a multi-well array. To the synthesized ligands, usually tested in their resin-bound form for preliminary screenings and in solution after cleavage for subsequent refinement, the reagents are added and the reaction course monitored by using a suitable high-throughput system capable of assaying activity and/or enantioselectivity in reasonable time. The search for reliable access to these data has stimulated the development of different detection systems[56-59] among which circular dichroism detection applied to HPLC on non-chiral stationary phases  and capillary electrophoresis on parallel columns containing a chiral selector as electrolyte coupled with laser-induced fluorescence or DAD detection [61, 62] have been reported as super-high-throughput analytical tools for simultaneous determination of yields and enantiomeric excesses of the products. More recently, the application of supramolecular principles to catalysis  has promoted the development of dynamic combinatorial libraries as collections of transient compounds reversibly assemblied under thermodynamic control from a number of building blocks [64, 65]. For given experimental conditions, the library composition is biased toward those members that form the most stable assemblies or aggregates. One of the most appealing application of this strategy makes use of a mixture of monodentate ligands, in place of a bidentate one, and their self-assembly in all the possible combinations around the metal allow to expand the size of library and catalyst diversity without the need to really synthesize new ligands. Indeed, for n monodentate ligands not only n homocombinations [M-LxLx] or [M-LyLy] are possible but also n(n-1)/2 heterocombinations [M-LxLy] and even mixtures of chiral ligands with achiral ones can be effective in their heterocombinations . Enhanced enantioselectivities for heterocombina-tions of two monodentate ligands with respect to the corresponding homo-complexes have been observed in Rh-catalyzed hydrogenation of different olefins with monophosphonites or monophosphites [67-69] (Scheme 2.7) as well as in conjugate addition of aryl boronic acids to enones or nitrostyrenes with Rh-phosp-oramidite complexes . ligand in creating a chiral environment around rhodium in asymmetric olefin hydrogenation (Scheme 2.8) [73, 74]. In the optimization of catalysts for asymmetric synthesis, some studies has been focused toward the use of more environmentally benign metals , since it is well-known that the majority of ''heavy metals'' display bioaccumulation and toxic effects on many living systems , despite of some of them (iron, copper, manganese and zinc) are essential for human health at suitable doses. However, classification of ''light'' beryllium as a human carcinogen  gives clear evidence that biological toxicity of metals results from different factors other than the atomic mass and correlation scales with ''softness'' of metal ions, charge and K values for their binding to soft ligands have been proposed [78-80]. Scheme 2.9 Iron-promoted asymmetric cis-dixydroxylation of olefins dihydroxylation. However, asymmetric iron-promoted reactions have been mainly restricted to transfer hydrogenation of ketones [86, 87] and a single example of cis-hydroxylation of olefin was reported with complex 22 (Scheme 2.9) to give the corresponding diols in high ee (up to 97%) but rather unsatisfactory yields . Indium and scandium have been also evaluated as useful metals for their low toxicity and high stability to air and moisture, the latter feature offering the possibility to recover and recycle the catalysts and perform reactions in water-based solvents. The moderate Lewis acidity and low heterophilicity of these metals make their complexes effective catalysts for C-C bond-formation reactions with good tolerance of different functional groups. The asymmetric carbonyl-ene, an important reaction for the atom-economic synthesis of homoallylic alcohols, has been carried out with "pybox" complexes of scandium or indium [89, 90] and a significant counterion effect on the reaction rate and selectivity was evidenced  (Scheme 2.10). Other interesting applications in enantioselective allylation of ketones [92, 93], Mannich-type reaction of aldimines  and asymmetric ring opening of meso epoxides  have been reported using N,N'-dioxide chiral ligands. Scheme 2.11 Gold(I) activation of allenes asymmetric induction in the hydroamination of allene 27 to afford the cyclic product in 88% yield and 98% ee . Scheme 2.12 Asymmetric amplification of chirality terms of ''chirality economy'', defined as the ratio (ee% x yield % of product)/ (ee % x mol% of catalyst), other than the obvious advantages in the efforts required for the synthesis and/or resolution of chiral ligands. Different effects leading to a non linear relationship between the optical purities of the catalyst and the product have been mechanistically investigated and high levels of enantioselectivity have been reported for some catalytic systems based on non-enantiopure or racemic ligands. Asymmetric amplification effects observed with some scalemic ligands have been rationalised with the formation of heterochiral (RS) or homochiral (RR or SS) dimeric species of the catalyst and two models, differing in the nature of the active catalyst, have been proposed by Kagan  and Noyori . In both models the formation of a less active heterochiral (RS) dimer results in the subtraction of the minor enantiomer of the ligand from the catalytic system, so that the reaction can be stereocontrolled by the more active homochiral dimer (RR or SS), in this form or in equilibrium with its monomers (Scheme 2.12). Since the amount of available catalyst in the reaction system is siphoned off by the formation of less active aggregates, the asymmetric amplification comes at expense of reaction rate and kinetic studies have been proved useful diagnostic tools for mechanistic insight and identification of active catalytic species . Strongly positive deviations from linearity, resulting in optical purity of the products higher than that of catalysts, have been observed in nucleophilic addition of dialkylzinc to carbonyls (Scheme 2.13), 1,4-addition of organozinc or organocuprates to enones and titanium-catalysed epoxidation, sulfoxidation, Diels-Alder and carbonyl-ene reactions . In chiral poisoning approach , a rather inexpensive chiral additive deactivates one enantiomer of the catalyst by selective complexation, so leaving the other enantiomer in more enantioenriched form available for catalysis and in an ideal case the addition of one-half an equivalent of poison to a racemic catalyst would leave one-half of an equivalent of active homochiral catalyst, with a process assimilable to a in situ resolution. In any case, the level of asymmetric induction can not exceed the level obtained with the enantiopure catalyst. 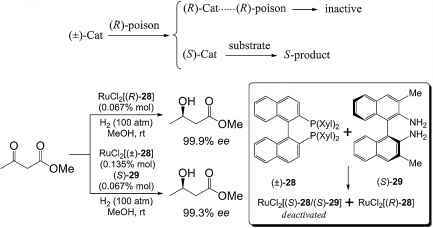 consequence of quantitative formation of deactivated RuCl2[(S)-28/(S)-29]  (Scheme 2.14). The addition of catalytically inactive (-)-DIPT-Ti(O-i-Pr)4 to (±)-BINOL-Ti(O-i-Pr)4 led to a moderately efficient poisoning system for chloral-ene reaction  whereas better enantioselectivities were achieved in the addition of allyltributyltin to aldehydes , in both cases as result of the deactivation of (R)-BINOL enantiomer. In the conceptually opposite strategy of asymmetric activation the addition of a chiral modifier to a racemic catalyst generates two diastereoisomeric complexes with matched and mismatched chiralities, one of which is more active and enantioselective than the original catalyst, so that the product ee is dependent on their relative concentrations, turnover frequencies and enantioselectivities . This approach, effectively applied by Noyori in asymmetric hydrogenation of ketones with racemic Ru-BINAP catalyst in the presence of enantiopure (S,S)-DPEN , has found advanced application in the activation of atropiso-merically flexible (tropos) ligands whose axial chirality can be fixed upon dynamically controlled complexation with a metal under the influence of a chiral additive . In such way, achiral pro-atropisomeric ligands can be used instead of chirally rigid racemic ones, that lead to the formation of competitive complexes from each enantiomer. complex (R)-BIPHEP-(R)-DANB 31, structurally characterised by X-ray analysis, able to act as an enantiopure catalyst in asymmetric hetero Diels-Alder reaction of ethylglyoxylate and 1,3-cyclohexadiene  (Scheme 2.15). Following the same approach, BIPHEP-Rh and 2,20-biphenol-Ti complexes were activated with (S)-20-amino-1,10-binapht-2-ol  and cinchonine , respectively, to give highly entioselective catalysts for ene-type cyclization of 1,6-enynes and Strecker reaction of N-tosylimines. The first examples of enantioselective intramolecular aldol cyclizations catalyzed by (S)-proline 32 without the participation of any metal were independently reported by Hajosh and Parrich  and Eder et al. (Scheme 2.16a) in early 70s but the potential of this catalytic reaction was not fully realised by the scientific community until 2000 when List described the first direct intermolecular aldol condensation between different aldehydes and acetone promoted by 30% mol of the same aminoacid (Scheme 2.16b) . High excess of acetone was required to suppress the reaction of aldehydes with the catalyst and aldols were obtained with optical purities ranging from 60% up to 96% ee with isobutyraldehyde. Since aldol condensation under classical Lewis acid catalysis required manipulation of substrates, converted into more reactive derivatives as silyl enol ethers, this report provided an atom economically breakthrough in this C-C bond forming reaction. data, involves the activation of ketone through an enamine intermediate followed by its reaction with an electrophile component assisted by the adjacent carboxylic group in an ordered transition state (Scheme 2.16c). catalysis . The origin of stereocontrol resides in the selective formation of (E)-iminium isomer, driven by sterical hindrance of the geminal methyl substit-uents, and in the shielding of the re-face of olefinic bond by benzyl group of 33 that leaves the si-face of substrate exposed to cycloaddition (Scheme 2.17). After these two pioneering researches an explosion of papers appeared in the literature witnessing the interest of organic chemists toward ''organocatalysis'', a term coined to indicate catalysis promoted by low molecular weight organic molecules, that has then emerged as a powerful strategy complementary to metalbased asymmetric catalysis. Organocatalysts meet several criteria established in green chemistry since they are non-toxic, stable to air and moisture with consequent operational simplicity and, in many cases, are available from natural sources or easy to prepare at relatively low cost. Beside proline other classes of effective organocatalysts have been discovered and most of them can be classified on the basis of their Lewis acid/base and Bronsted acid/base character  or in function of the activation modes , strictly related to the nature of intermediates generated from catalyst interaction with the substrate fuctional groups (carbonyl, alkene or imine) in a highly organized and predictable manner. Enamine-based oganocatalysis with proline and diamines has been extended to different aldol, Michael or Mannich reactions  whereas a,a-diarylprolinol silyl ether 34 showed to be an excellent catalyst with general applicability in asymmetric direct a-functionalisation of carbonyl compounds . Among the most notable examples, proline-catalyzed aldol reaction of hydroxyketones to afford anti-diols  revealed to be an effective protocol complementary to Sharpless dihydroxylation while a-fluorination of aldehydes in the presence of 34 offered a general procedure for the introduction of C-F bonds (Scheme 2.18a-b). Interestingly, the reversal of the syn-diastereoselectivity observed in proline-cat-alyzed Mannich reaction of aldehydes and protected a-iminoglyoxylate was achieved through a computer-aided rational design of catalyst 35 . It allowed better stabilization of the syn-enamine intermediate evolving toward the anti-Mannich products thanks to the sterical contribution of C-5 methyl substituent and the larger distance between amino and C-3 carboxylic groups (Scheme 2.18c-d). In iminium catalysis, the higher reactivity of iminium ion compared to carbonyl species activates a,b-unsaturated aldehydes and ketones to 1,4-addition of several nucleophiles and cycloadditions . The enantioselective addition of malonates to enones and enals has been screened with different organocatalysts and valuable application in the formal syntheses of (—)-paroxetine and (+)-femetoxine was reported by J0rgenson's group . Imidazolinone 36 gave high asymmetric induction in the addition of electron-rich benzenes and heteroaromatic nucleo-philes to enals  (Scheme 2.19) and useful intermediates for the synthesis of biologically active compounds, as homotryptamines, (+)-curcuphenol and rhazinilam-related alkaloids, have been prepared by this route.